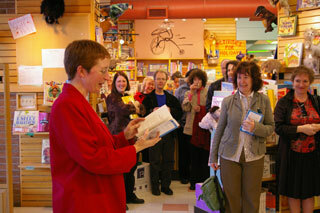 Theodora Bear was among the Orca Books titles invited to appear at Vancouver's wonderful children's bookstore, KidsBooks. Click here to see more pictures from Kidsbooks and other events, and artwork by young readers. 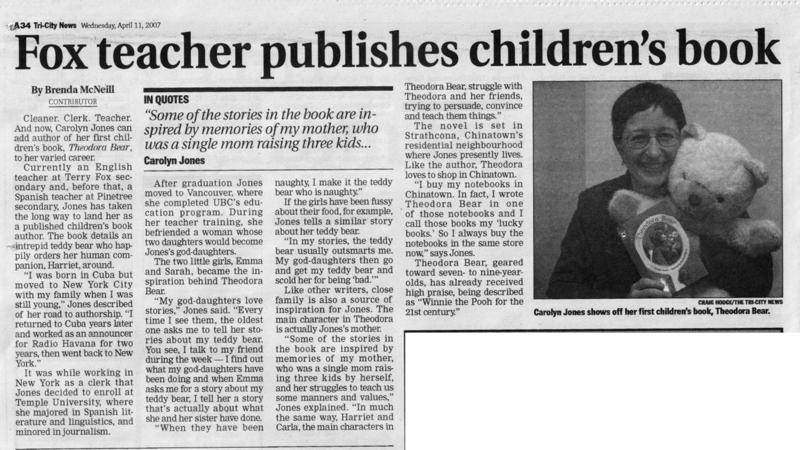 Click here to read an article from the Tri-City News about Carolyn and Theodora. Click here for a Christmas round-up from Burnaby Now suggesting Theodora Bear as a great gift for kids. Click here to see a review by a reader in Wales. Click here for some reviews by American and Australian readers. I have survived my first day at St Joseph's School. I had four classes, Upper Kindergarten (a real nightmare, but thank goodness the teacher was there to keep some sort of discipline); and grades I, II and VI. The latter were quite fun. I used Theodora Bear and got in some "th" practice with the name [reference to previous experience: "stick out your tongue between your teeth and blow" - kiddies quite take to it].